A range of compact and ultra-compact sensors have been developed for ambient particle monitoring. Under license to Alphasense these devices are now being manufactured as OPC-N2 units. With 16 size bins between 0.38µm and 17µm it can measure up to 10,000 particles per second, either saving data to an on-board microsd card or connected via SPI or USB. Independent comparison with industry standard instruments carried out at the University of Manchester shows good agreement. This, combined with the low cost and the flexible communication protocols makes it ideal for large scale networks. 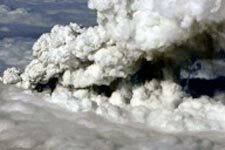 The technology has been used by the University of Cambridge around Heathrow airport, for detecting volcanic ash during the eruption of Eyjafjallajökul, on balloon-borne radio sondes over Kuwait and more recently as part of the AirSensa network across London. The AirSensa project is creating a UK-wide network of urban air quality monitors that include OPC-N2 technology. They are starting in Greater London, to monitor and visualise air quality right down to individual street level. Up to 10,000 sensors are to be placed in schools, public and commercial buildings to monitor and feed back data to the cloud where it will be made available online and via smart-phone apps. CACP's interest in low-cost modules for counting and sizing micrometre-sized airborne particles began in 2009 with the DREAME project, funded by NERC (Natural Environment Research Council, NE/G007268/1). DREAME (Dust Radiation Electrification and Alignment in the Middle East) was led by CACP's Joseph Ulanowski in collaboration with the University of Reading and involved a study of Saharan dust clouds. These clouds can spread over vast areas as they move out over the Atlantic ocean and can have a significant effect on climate by their interaction with sunlight. DREAME involve both aircraft and balloon-borne (radiosonde) measurements and, since the chances of recovery after balloon launch were small, the latter required the rapid development of small aerosol optical particle counters (OPCs) that were cheap enough to be 'one-shot' devices. 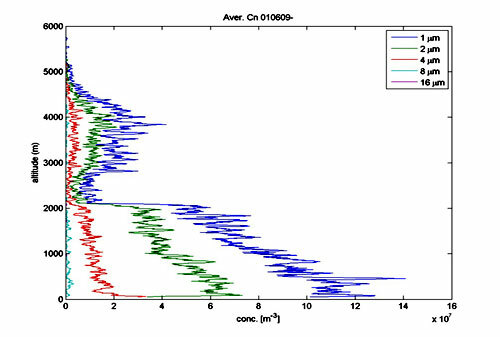 An example of the aerosol sizing data produced by one of particle sensors during its balloon ascent over Kuwait. 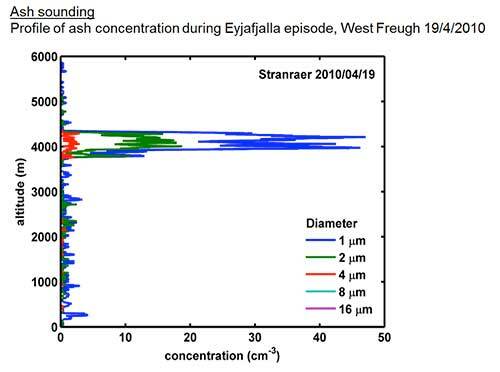 An unforeseen application for the low-cost optical particle counters arrived following the eruption in April 2010 of the Eyjafjallajökull volcano in Iceland. The volcanic ash cloud produced by the volcano spread across northern Europe and grounded virtually all air transport, causing huge commercial losses. Since even research aircraft capable of detecting and measuring the volcanic ash were prevented from flying, the authorities had significant difficulty in getting the ash measurement data that was required to justify the flight ban of commercial aircraft. 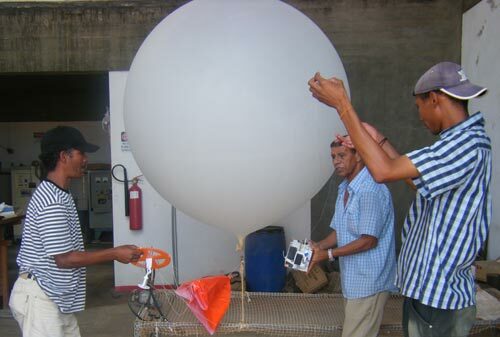 The UK Met Office therefore commissioned from CACP further batches of the low-cost particle sensors that could be assembled with radio transmitters and launched by balloon to try to detect the presence of ash in the upper atmosphere. These completed radiosondes were subsequently launched from various locations and provided the data (see example below) that proved the presence and high density of the ash layer. This type of data not only fully justified the grounding of commercial flights but also allowed verification of the Met Office's theoretical predictions of how the ash cloud would spread across Europe. An example of the detection of the Icelandic volcanic ash cloud by CACP's low cost OPCs. Measurement taken in April 2010. 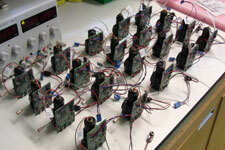 A further development of CACP's low-cost particle detection technology came in 2011 with the commencement of the NERC project 'High density sensor network system for air quality studies at Heathrow airport' (NE/I007296/1; visit http://www.snaq.org/ ). This project, led by Cambridge University, sought to deploy a large network (60+) of so-called 'SNAQ' sensor modules around Heathrow airport in order to acquire detailed information on the spatial and temporal behaviour of airborne pollutants. The modules already had advanced detectors for various gases including NO, NO2, CO, O3, CO2, hydrocarbons, and SO2, but also wanted the ability to continuously measure aerosol concentrations over long periods. CACP's role therefore was to design and produce these low-cost aerosol spectrometers, and subsequently assist analysis of the data they produced. Unlike the DREAME particle counters above, the particle counters produced for the SNAQ modules employed a novel design which obviated the need for an air-pump and associated particle filters. Instead, an 'open-path' design based around custom fabricated elliptical mirrors and dual-element photodiode detectors allow simple and robust particle detectors to be produced. The SNAQ particle detectors have been designed to run continuously for several months, reporting aerosol concentrations to the network host computer over 200 ms intervals several times each minute. 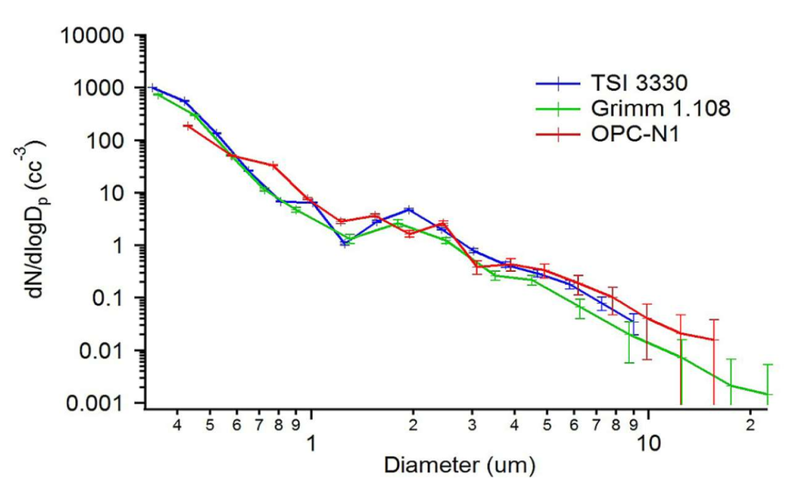 The data is in the form of 16-bin size histograms covering the size range 0.38-17µm, as in the example below. 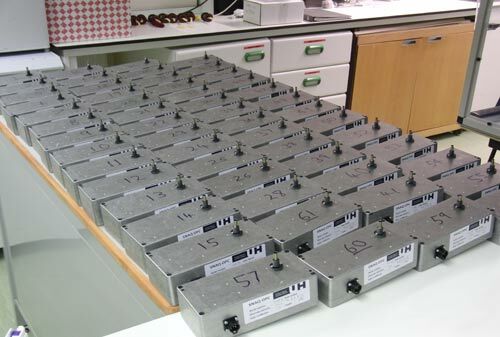 SNAQ particle detector modules during production. Example of ambient aerosol size distribution as measured over 200ms by one of the SNAQ Heathrow OPCs designed and built by CACP. The SNAQ Heathrow measurements will continue throughout 2012 and early 2013, followed by detailed analysis and reporting.